You know those grand mansions in Parktown you drive past all the time? Well, here’s a way to stop and take a peek inside some of them. 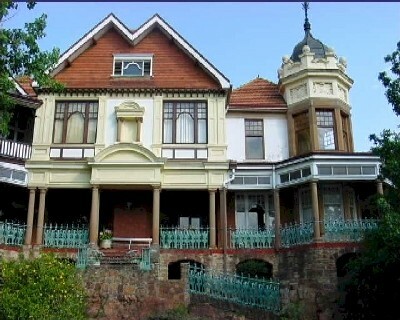 The Parktown & Westcliff Heritage Trust (www.parktownheritage.co.za) conducts weekly tours of old Johannesburg, and one of those tours is Victorian Parktown. Actually, not much of Victorian Parktown still exists. The site which today contains the Johannesburg College of Education and the neighbouring Pieter Roos Park used to be the centre of the elegant garden suburb of the Randlords. Parktown used to be fenced off, and residents entered via a gate. In the centre of the suburb, in the present-day Wits School of Business grounds, was The Oval, a pasture where cows where brought every morning to graze. Some 56 gracious homes – many of which used imported materials – were demolished to build the Johannesburg College of Education and the Pieter Roos Park. More houses were sacrificed for the M1 North, built in 1975. But those that are left have a grandeur and elegance about them that transports one easily into the Victorian era. First stop is the house now used for Mike’s Kitchen, Eikenlaan, in St Davids Place, built for James Goch, a photographer of the early Johannesburg scene. The house was designed by JB Nicholson and has survived by being a hotel in the 1930s, then the Overseas Visitors’ Club in the 1960s. The city council wanted to demolish it in 1978 but the Heritage Trust stepped in and quickly got together 12 000 signatures, which changed the council’s mind. So in 1989 it became Mike’s Kitchen and retains its elegant presence in the suburb. Several blocks down the road is Wanooka in Girton Road, built in 1902 by architect FC Smith for Henry Greenwood, who came to Johannesburg to head up the local railways office. It has high steel ceilings, oregon floors, and a three-sided verandah. In an effort to save it from being demolished, Hunt Leauchars and Hepburn, a coal mining export company, bought the property and built their offices behind the house. They have built a passageway from their modern glass building into Wanooka, which they now use for offices and boardrooms. The house is looking a little the worse for the weather, but still retains its splendour, with beautiful gardens, including an old jacaranda tree and a broad bed of agapanthus and wild rhubarb. No one is clear on the origin of the name ‘Wanooka’, but it is believed to be a lake in New Zealand or a town called Wanakah in New York state. Next up is Dolobran, probably one of Johannesburg’s most well-known mansions with its fairytale look obtained from a mix of architectural styles. Situated on the corner of Jubilee Road, Oxford Road and Victoria Avenue, this house was designed by JA Cope-Christie, after the owner, Charles Llewellyn Andersson, rejected Herbert Baker’s design. The house contains a variety of window shapes, crisscrossing gables, beautiful Art Nouveau stained-glass windows, a corner turret with a weathercock (another one exists on top of the stables). Andersson must have been a cautious man as the house was one of the first in Johannesburg to have a burglar alarm system installed in 1904, when the house was built. There must have been some serious entertaining going on in its large dining room as the house has four pantries. The owner, Josephine Andersson, has been around for a while to fill those pantries – she was Andersson’s second wife, and she died in 1998, at age 98. The garden has an old world quality to it: most of the southern outer wall is planted with bamboo for privacy, and several ponds are surrounded by irises, pansies, and old-fashioned foxgloves. The rose garden is just beginning to bloom. Several mature jacaranda and oak trees give the garden its graceful ambience. The house is occupied by the great-great grandchildren of Andersson, who are presently making renovations. The dome was recently removed and its base was restored. Unfortunately entrance into the house is prohibited but Hannes Meiring in his book Early Johannesburg describes a “profusion of ornate furniture in the drawing room – even a spinning wheel – and walls adorned with hunting trophies and family photographs.” He also indicates that Dolobran has the “best collection of Art Nouveau in all of Johannesburg”. It is believed that much of its original furniture and Art Nouveau decoration is still intact. The Heritage Trust is hopeful that in the near future the house may be opened to the public, at a fee. The queue on opening day is bound to be long. North Lodge is across the road from Dolobran, built in 1905, and often referred to as the most romantic house in Parktown. The reason for this is that it was modelled on French and Scottish castles although its most charming feature – two conical turrets – is no longer there, having been removed due to fear of collapse. The house was built for Henry Wilson and designed by Herbert Aldwyncle. A delightful feature of the house is the conservatory at the side, with its bevelled coloured windows. The house retains its wooden floors, and steel ceilings, with several beautiful fireplaces, and wood-panelled entrance rooms. The house still has a huge peppercorn tree at the back, near the stables, planted to keep the flies away from the horses. In the front of the house are two ancient-looking balhambra trees with gnarled trunks, popular with early Johannesburgers. Wilson had an affinity for the horses used in the Anglo Boer War – he made his fortune selling oats for those horses, and become known as the Oat King. Nowadays the house is owned by the University of the Witwatersrand, and is used as a students’ residence. Several blocks from North Lodge is Outeniqua in St Davids Place, which used to look across at The Oval. Its distinctive feature is that it has four different facades making it attractive and interesting. The house still has a large copper pot in the laundry. It was decided to establish an Ohlsson’s Brewery in Johannesburg, and the house was built for the manager. It was called the Ohlssons House and renamed Outeniqua in 1957. It is also part of the Wits campus, now used for offices and lecture rooms. Parktown was established in 1892 and is now characterised by a series of office blocks built in a range of architectural styles, none higher than five storeys, to retain its village atmosphere. Victorian Parktown doesn’t stop at these houses: Northwards is considered one of the most stunning houses in Johannesburg, the Parktown Convent has recently been restored, The View in Ridge Road is the oldest house in Johannesburg, built in 1896, Hazeldene Hall, Emoyeni or Highfield Manor, Arcadia, The Pines and Savernake all stand proudly as a reminder of wealthy times in Johannesburg’s past.